BEIRUT A car bomb ripped through Beirut on Friday, killing a top security official and seven others, shearing the balconies off apartment buildings and sending bloodied residents staggering into the streets in the most serious blast the Lebanese capital has seen in four years. Friday's blast was also a reminder of Lebanon's grim history, when the 1975-1990 civil war made the country notorious for kidnappings, car bombs and political assassinations. Even since the war's end, Lebanon has been a proxy battleground for regional conflict, and the Mediterranean seaside capital has been prey to sudden, surprising and often unexplained violence shattering periods of calm. "Whenever there is a problem in Syria they want to bring it to us," said Karin Sabaha Gemayel, a secratary at a law firm a block from the bombing site, where the street was transformed into a swath of rubble, twisted metal and charred vehicles. "But you always hope it will not happen to us. Not again," she said. CBS Radio News reported the explosion happened in a student area, near the American University of Science & Technology. "I was standing nearby in Sassine Square and I heard a big explosion and I ran straight to it," resident Elie Khalil said. He said he saw at least 15 bloodied people in a nearby parking lot before medics arrived and took them to a hospital. Syrian Information Minister Omran al-Zouebi denounced the bombing, calling it a "terrorist and cowardly" attack. Syria's top ally in Lebanon, the Shiite Hezbollah movement, also condemned the attack, expressing its "state of great shock over this terrible terrorist crime." It called on the authorities to catch the perpetrators and on all political forces in Lebanon to work against "every conspirator against the security, the life, the safety and security of the nation." In Washington, U.S. State Department spokeswoman Victoria Nuland condemned the blast "in strongest terms." She said the U.S. had no information about the perpetrators. National Security Council spokesman Tommy Vietor also said the White House stands by the people of Libya in this "heinous attack." 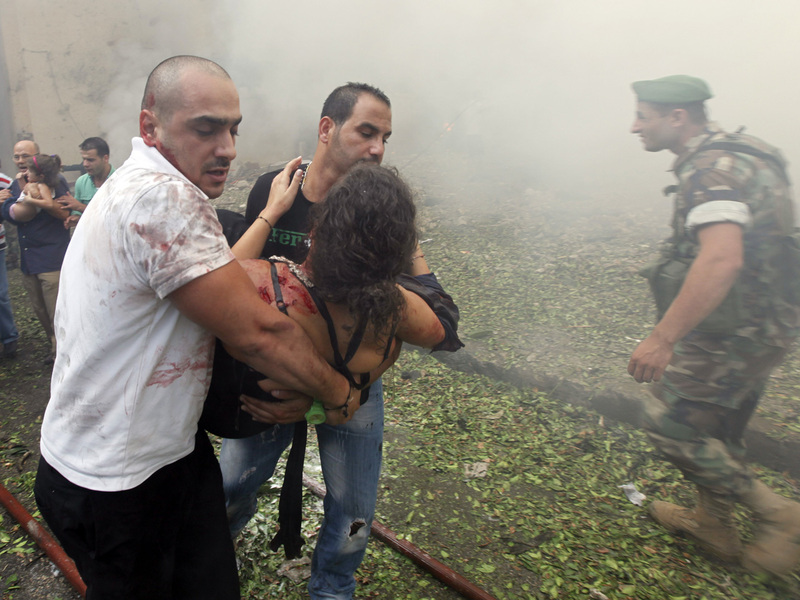 "I'm very worried about the country after this explosion," Beirut resident Charbel Khadra said Friday. "I'm worried the explosions will return - and this is just the first one."